About one and a half years ago, Samsung introduced Samsung Experience as a replacement for their aging and bloated Android user interface named TouchWiz. By updating its flagship line of smartphones with Samsung Experience, the Korean electronics company gradually brought in a significantly new interface, along with features like Game Launcher, Bixby, and Always On Display. Unlike its predecessor, Samsung Experience was received well by reviewers and users alike. Now, Samsung is finally bringing that same freshness to its mid-range smartphones as well. 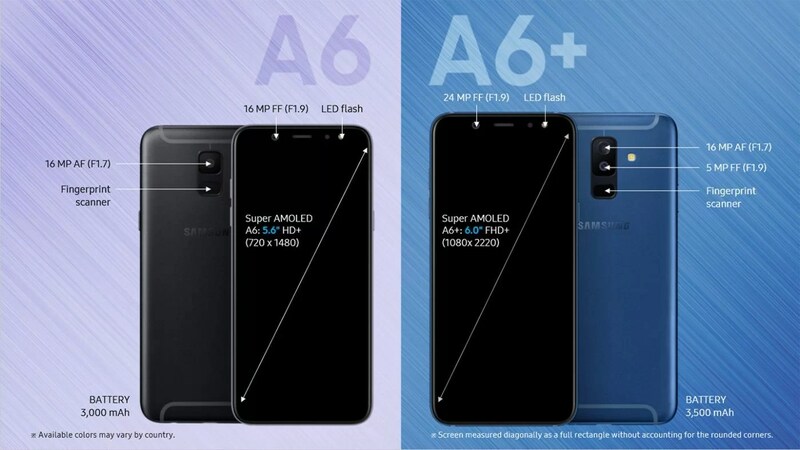 Replacing the previous generation of Galaxy A-series and J-series smartphones as of May this year are the new Samsung Galaxy A6 and Samsung Galaxy A6+. Presumably, the Galaxy A6+ is the larger version of the Galaxy A6. Not so presumably, the Galaxy A6+ is powered by a modest Qualcomm Snapdragon 450 chipset and an Adreno 506 GPU, while the Galaxy A6 sticks to a Samsung-made Exynos chipset and a Mali GPU. Design The Galaxy A6+ is a true Samsung in that it knows how to dress up for a given budget. The phone’s body is tall and well rounded around the corners. As if to complement the rounded body, a tall, equally well-rounded display covers up most of the front face of the phone. The front face is made of 2.5D glass, giving the phone a smooth and premium feel. Its metal unibody construction becomes apparent while holding the phone in the hand. Two thick antenna lines on the phone’s back curve outward on the top and bottom, lending the phone a unique look. Aligning to signature Samsung smartphone body design, the two lenses for the rear cameras sit one below the other in the middle of the upper half of the phone’s back. A tiny fingerprint sensor joins in below them. The fingerprint sensor is so tiny it takes the phone upwards of ten scans to register your fingerprint. A tiny single-LED flash accompanies these elements on the side. Coming back to the front face, we see narrow bezels, and an equally sized chin and forehead. The forehead houses the earpiece, the necessary sensors, the front camera, and a single-LED flash, while the chin stays clean. The left side of the phone contains the volume buttons (they’re two separate buttons) and two slots (for SIM cards and a microSD card). The bottom side contains a microphone, a microUSB port, and a 3.5mm audio jack. Interestingly, the speaker alone has moved to the right side; it sits right at the top of the phone’s side, just above the power button. The Samsung Galaxy A6+ looks good and feels sturdy. Picking up the phone and holding it could be a slightly tricky affair because the metal on the back makes the phone slippery. The back side is prone to smudges, but the display remains mostly free of smudges and fingerprints. In summary, the Galaxy A6+ scores very well in the design department. Display The text in the middle of the phone’s box reads, ‘A6+ [Infinity]’, dropping a hint to the beholder that the phone inside features an Infinity Display. While the display doesn’t span edge-to-edge (like the picture in the phone’s website dubiously suggests), it does have a very tall aspect ratio of 18.5:9. It’s a 6-inch Super AMOLED panel with a resolution of 1080 x 2220 pixels, giving us a healthy pixel density of 411 pixels per inch. As expected of an Infinity Display, the screen is bright and colours on it appear vibrant without looking overdone. At its lowest brightness setting, the screen has a luminance of 5 LUX, and at its highest, 720 LUX, which is a very wide range. A Screen Mode section in Settings allows you to adjust the ways colours are reproduced. Apart from letting you select from preset colour modes, the phone also lets you adjust the overall temperature of colours and the intensity of reds, greens, and blues. An inbuilt schedulable blue light filter warms the screen at night. The Always On Display feature takes advantage of the sAMOLED screen’s ability to power on individual pixels without wasting too much juice by showing notifications and a clock style of your choice even when the phone is locked. Double-tapping the optional home button in this mode can wake the phone up for you. The unusual 18.5:9 aspect ratio of the display initially causes overlays to appear in some games, but this problem is easily overcome by dragging the navigation bar out and clicking on the Game Tools button. Inside the tool you can enable or disable options like ‘Full screen’, ‘No alerts during game’, and ‘Auto brightness lock’. Because the display is rounded, contents around the corner of it look more pleasing to the eye. Imagine you’re holding a typical rectangular business card by its corners. Then imagine you’re holding the same card with its corners scissored off smoothly. Which one do you like better? Exactly. It’s a remarkable display for a phone of its price, all in all The side-firing single speaker is clear and loud but invariably gets in the way of the index finger when the phone is held in landscape mode for video playback and gaming. It’s otherwise good for audio playback and ringtones. A Separate App Sound setting allows you to stream only music through a connected Bluetooth speaker and all the other ding and dong sounds from other apps through the phone speaker, making for a less interrupted audio playback. Performance I must admit that when I penned down my first impressions of the Samsung Galaxy A6+, I was apprehensive about the performance of the phone. For a phone of its price, I was expecting it to be powered by a chipset more sophisticated than the Qualcomm Snapdragon 450 it comes with. Having used the phone for several days now, I feel only some of those apprehensions have been put to rest. I tried everyday tasks like browsing, texting, and video playback. The phone managed to switch between Chrome tabs fast enough even as the tab count rose to over thirty without refreshing pages too much, but displayed jagged animation. Switching between apps happened without too much of a fuss as well, but there were signs of lag every now and then. Samsung’s UI manages to mask slow loading times of apps by showing long animations, which is a clever trick for apps that aren’t already minimised. Strangely and surprisingly, the Samsung Galaxy A6+ took home pitiably low scores on benchmark tests. Its scores on GFX Bench (while simulating a car chase), AnTuTu 7.0, Geekbench, and 3DMark were all significantly lower than those scored by the Nokia 7 Plus, which costs only a few thousand rupees more. In two of the benchmarks, the scores were only half of what the Nokia 7 Plus had scored. Luckily, none of this reflected too much in real-world usage. Playing light action games like Air Force: Joint Combat showed no signs of delay or stutter. Even a racing game like Asphalt 8 was handled well without stutters. On no occasion did the phone heat up in my hands to a point where it became unpleasant. An inbuilt Game Launcher app let me choose performance modes while gaming so I could conserve battery better. Everything considered, performance of the Samsung Galaxy A6+ isn’t what you’d call bad, but it isn’t what you’d call spectacular either. If anything, Samsung could have chosen to use a 6-series Qualcomm processor to achieve better performance, seeing as how many other things about the phone paint such a positive image. Camera The camera setup on the Samsung Galaxy A6+ is interesting: on the back there’s a 16-megapixel sensor coupled with a 5-megapixel depth-sensor, which is pretty normal according to today’s standards. Surprisingly, on the front there’s a significantly larger 24-megapixel sensor. There’s a single-LED flash on either side. These specifications translate to bright and colourful photos in the day, but noisy and pixelated photos at night. Photos taken outdoors are clear and well detailed; and to be fair, photos taken indoors under the lighting of a typical office don’t look too shabby either. Photos taken in a proper low-light setting disappoint; they’re quite grainy, and there’s noticeable pixelation around subjects in the foreground and background. In the same low-light setting, the front camera fares better, but only slightly; photos fail to look completely in focus no matter what you do. The default camera app from Samsung is one of the easiest camera apps I’ve used. The on-screen shutter button doubles up as a movable slider for zooming in and out. Swiping up or down on the viewfinder area switches between the front and back cameras; it’s an easy way to switch cameras when you’re in a hurry and don’t know which button does what. Tapping on the round on-screen shutter button elicits a quick response from the camera, even when it’s pressed quickly in succession. Apart from the regular picture-taking mode, there are three special effect modes. The first mode is called Live Focus. It’s a mode that takes advantage of both cameras at the back to create photos with a Bokeh effect; the subject in the foreground is in complete focus, while the rest of the background is blurred. An adjustable slider allows you to set the intensity of background blur. The Live Focus mode works accurately most of the time, but can mistakenly blur parts of the foreground subject at times. The second mode is called Stickers. It allows you to add animated stickers to your photos as you take them; so you can grow virtual dog paws and sport a virtual hat if that’s your thing. The last mode is called Bixby Vision. It’s a mode in which you can point at real-world objects and expect Bixby, Samsung’s virtual assistant, to find relevant answers for you online. I pointed at numerous objects after signing up for a Samsung account and found Bixby giving me relevant results five out of ten times. All said, the camera setup on the Samsung Galaxy A6+ is good for all daytime and most indoor photos, but is no good for low-light scenes, whether its taken through the front camera or back. The Live Focus mode is capable of creating good-quality Bokeh-style shots. Battery The 3,500mAh battery on the Samsung Galaxy A6+ is good for up to a day and a little more on a single charge if you’re using the phone for activities like web browsing, video playback, and messaging. On the navigation test, I had Google Maps running with the display on at 60 percent brightness, Wi-Fi on, and Bluetooth off. The Galaxy A6+’s battery dropped from 67 percent to 52 percent in an hour and forty minutes. I imagined the Always On Display feature of the phone would consume lesser battery than what it did when I had it turned on and left the phone untouched for a full day. The feature accounted for 30 percent of the drain over a period of around forty hours. Charging is a slow affair. A full charge happened at a disappointingly steady pace of nearly three hours. A fast charging option would’ve been appreciated. Bottom line It’s good to see some of the best of modern Samsung technology—Samsung Experience, Infinity Display, etc.—finally make its way from the flagship models to the mid-range models as well. Using the Galaxy A6+ was a pleasurable experience for me if I take into account the build quality, the wonderful display, and the intuitive new take on Android by Samsung. What left me disappointed, however, was the day-to-day performance of the phone, as I was often faced with occasional slowdowns. Even the camera performance left a little more to be desired, given that it could not do a good job in low light. At a seemingly high retail price of Rs 25,990, the Samsung Galaxy A6+ is a smartphone to consider if you’re a Samsung loyalist or like the company’s new take on Android. Other than that, it feels somewhat underpowered at this price, especially with more powerful options available at for a little more money.